This is an updated version of instant pot honey garlic chicken. The original recipe was having too many burn notifications and there wasn’t enough sauce. I fixed the recipe and I really think you’ll like it! Add honey, soy sauce and broth into bottom of Instant Pot. Whisk really well, until smooth. Add in the garlic. Trim the chicken of excess fat. Nestle the chicken into the pot. Pour rice into a mesh strainer. Rinse the rice well. Add rinsed rice to an oven safe dish that will fit inside your Instant Pot. I used this corningware dish. * Add 2 1/4 cups water into the dish. Cover the dish with foil. Place the dish on top of your trivet with handles. Carefully lower the dish down into the pot on top of the chicken. When the timer beeps let the pressure release naturally for at least 10 minutes (I did a bit longer than this). Gently move the valve to “venting.” Once all the pressure is released remove the lid and very carefully remove the rice bowl with hot pads. The bottom of the rice dish will be messy from the sauce of the chicken. I just transferred my rice to a clean bowl. Turn the Instant Pot to the saute function and adjust to “more”. In a small bowl stir together 1/4 cup cornstarch and 1/4 cup cold water until smooth. Stir the mixture into the pot. It will start getting thick in a couple of minutes. Stir every so often. Open the bag of frozen broccoli and pour it into a colander. Run some hot water over the broccoli and then shake off excess water. 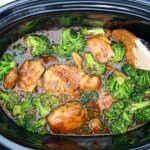 Pour the broccoli into the Instant Pot. Stir the broccoli in and let it warm through. You may want to push the saute button on your Instant Pot to get the broccoli warm a little faster. I purposely remove the lemon juice from this recipe. I felt it was too strong and didn’t pair well with the broccoli. If you want to see the original recipe scroll down. The chicken: I love using the Costco boneless, skinless chicken thighs for this recipe. But you can also use bone-in chicken thighs. Just make sure to remove the skin and trim any extra fat off before throwing them in the pot. I haven’t tried this particular recipe with boneless, skinless chicken breasts. This would not be the best choice because the chicken would get overcooked by the time the rice got done. However, if you wanted to make the chicken without the rice you could do that. Just cook for only 10 minutes for boneless breasts.